A Platform for Sharing Ideas for Living Trash-Free and Happy, Too. 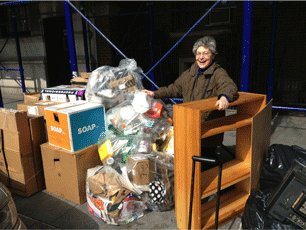 WeHateToWaste.com founder Jacquie Ottman has been finding treasures in NYC’s trash since age 4. We all create too much trash. But no one wants to give up convenience. No one wants to go back to the War, the Depression, or even Yankee New England. So, what is the way forward? What kind of lifestyle would enable consumers to live trash free and happy, too? That’s what we’re trying to figure out here at WeHateToWaste.com. Join us. I’m Jacquie Ottman. My colleagues and I created WeHateToWaste.com in 2012 as a space for waste-aware individuals from around the globe to share what they happily do to live less wastefully. Then, by shining a spotlight on their stories, others can be inspired to live less wastefully, too. Why are we doing this? First, it makes us feel good. It aligns with our mission. And we learn — a lot. When we engage with our story sharers, we get ideas and insights into what takes to shift consumption culture into sustainable mode. We, in turn, share our insights with influencers who can create inspired policies, more resource-efficient products, even new forms of art that can move the masses. Want to Learn What It Takes to Live Trash-free and Happy, Too? Start by learning about the seven facets of what we call the Trash-Free and Happy, Too Mindset HERE. While you’re there, focus in on our favorite one, Share Rather Than Own. It’s all about new ways to Share, Swap, Borrow, Donate and Gift the stuff that already exists. Sharing rather than owning stuff is also a great way to save money and rebuild our communities. Sharing makes so much sense for people in densely populated areas like our own hometown of New York City. IF YOU’RE AN INDIVIDUAL who hates to see things go to waste, feel free to browse the stories that have been posted here. Join the conversation by commenting. Get inspired. Take away new ideas to live more trash-free and happy yourself. Share a story of your own. IF YOU’RE A PROFESSIONAL in business, government, or an advocate, tap into our insights for enlightened policies, programs and new products and services that can help transform the marketplace. We’re available for a telephone conversation, a project, a keynote or thought leader panel. Learn more HERE. Want to talk? Feel free to get in touch with us directly. WeHateToWaste.com is a social initiative of J. Ottman Consulting, Inc.